The Franklin Co-operative Mercantile Institution at 113 E. Main in Franklin Idaho turns 150 years in October. It his it he first store in the State of Idaho. The Franklin Co-operative Mercantile Institution in Franklin, Idaho will turn 150 years old in October. The store was a part of the Zion Cooperative Mercantile Institution founded by Brigham Young, the leader of the Church of Jesus Christ of Latter-day Saints in 1866. The store was built only six years after the town of Franklin was founded by 61 families. The settlers thought they were still in Utah, at the time. Items from the old Franklin Co-operative Mercantile are on display at the Relic Hall builtin 1937. Stone for the building was quarried form the same Stockdale Quarry used on the Logan Temple. The store opened with $2,400 worth of food and supplies needed for the fledgling community. The store also housed the first telegraph office in the state of Idaho. The reason for creating their own store was the mounting price gouging by wholesalers and merchants who despised the religious group. The Salt Lake ZCMI became a successful venture and they soon began to manufacture their own clothing line, leather goods, and a host of other supplies. The goods would be sent to the satellite stores like the one in Franklin. The Pioneer Relic Hall adjacent to the FCMI has a display of artifacts that came from the shelves of the old store. The Franklin store was recognized as the first mercantile in the state of Idaho and is one of a few original ZCMI stores still standing. 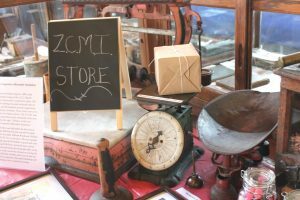 ZCMI was recognized as the first department store in the country and not only carried clothing and leather goods but also carried building materials. A good part of the merchandise was manufactured in Salt Lake. Business at the Franklin Co-operative began to decline and the store eventually closed in 1880. The Idaho Pioneer Association purchased the building in 1923 after housing several families over the years. Elliot Butterworth, an early collector of pioneer artifacts, found what he could and put them on display in the vacated building and turned it into a relic hall. When he ran out of room in the old stone building, he lead the charge for building the relic hall Franklin has today. In 1991 the building was given to the Idaho State Historical Society, who owns it presently. Over the years the department store continued to have success until December 1999. ZCMI was sold to the Macey’s department store chain. The facade of the original ZCMI was used in the City Creek Center. And they also retained the original ZCMI nameplate.